The weather remains so perfectly gorgeous I can’t offer up any sort of complaint about it at all other than we need some rain. We’ve not had any worthwhile rainfall for a couple weeks now and have had to resort to regular waterings of the garden. Our rain barrel is almost empty and this morning I had to let the hose run on the apple trees for a little while because even they were beginning to look unhappy. There has been rain in the forecast a few times but it seems that as soon as it gets to the city it just evaporates. There is significant rain promised for tonight and because we gave the garden a good watering this morning it is bound to happen. I should probably also wash the car for good measure. I am still picking beans. We have beans coming out our ears. We even gave some to our neighbor of the cherry tree because his beans aren’t doing well. I read somewhere last year that as long as you keep picking beans and don’t let them go to seed, they will keep producing. It seems to be true. I am tempted to stop picking them but then I consider that if I do, I will regret it come December when we are eating the last frozen bunch from the freezer. zucchini than I thought possible. No wonder I have heard stories about gardeners leaving baskets of zucchini on neighbor’s porches in the middle of the night because they don’t know what else to do with them and they can’t get rid of them fast enough. 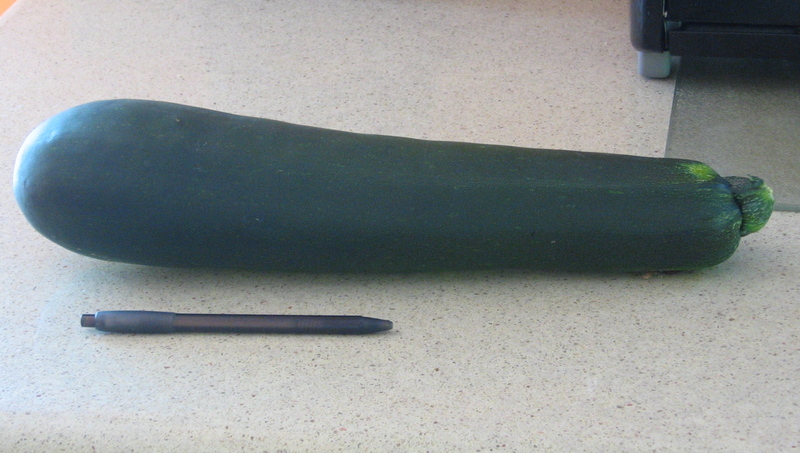 I pulled another huge zucchini out of the garden this morning. I put a ballpoint pen next to it for scale in the photo. Last week this squash was the size of a fat pencil so I didn’t think to bother checking it during the week. Mistake! Bookman is in the kitchen as I type shredding it up to freeze. We will use it later on this year to make some zucchini bread or muffins once the thought no longer makes us cringe and beg for the zucchini insanity to stop. Until then, there are more out in the garden I will be keeping an eye on. I found a zucchini fritter recipe earlier this week that Bookman is going to veganize. They are like potato latkes (yum!) except with zucchini instead of potatoes. Looking forward to trying them and if it is a success, of course we’ll share the recipe. I’ve mentioned that we get free wood chips from the city, they have designated free chip piles in various locations. About a month ago we had a big storm and we lost about 3,000 trees across the city. Gardeners were looking forward to making lemonade from the disaster, expecting there would be lots and lots of wood chips. But the chips never materialized. Some gardeners got grumpy because really, the wood chips aren’t free. We pay for the service through our property taxes. Someone complained to the Park and Recreation Board. And then more people complained. And then there was a bit of a scandal. Turns out in order to save money the city cut back on its chipper crews and sent most of the chipping to Koda Energy, a company that rents land from the city and burns the chips in a waste-to-energy plant. The city didn’t pay for the disposal nor did Koda Energy pay the city for the wood, it was a sort of equal exchange of services. Except that gardeners were left out of the equation. There ended up being so much uproar about it the city got Koda Energy to donate wood chips back to them through August second so the city could keep a limited number of wood chip piles stocked up. bags so we could keep working on our garden path. But on the off chance that there might still be some, I sent Bookman to the pile by our lake and we hit the jackpot. Bookman made about four or five trips this morning filling trash cans and five-gallon buckets. Now we have a rather large pile of wood chips in our garden that should meet our needs for the path and then some. It’s nice to be lucky for a change. Our garden path is half done. I will be sure to take a photo and share our work when it is completed in a week or two. Or three. Maybe four. Not much new blooming this week. The sunchoke, also called Jerusalem artichoke is blooming. It is in the sunflower family and makes edible tubers. I only planted one plant so will have to wait a year or two for it to spread a bit before I can harvest any of them. 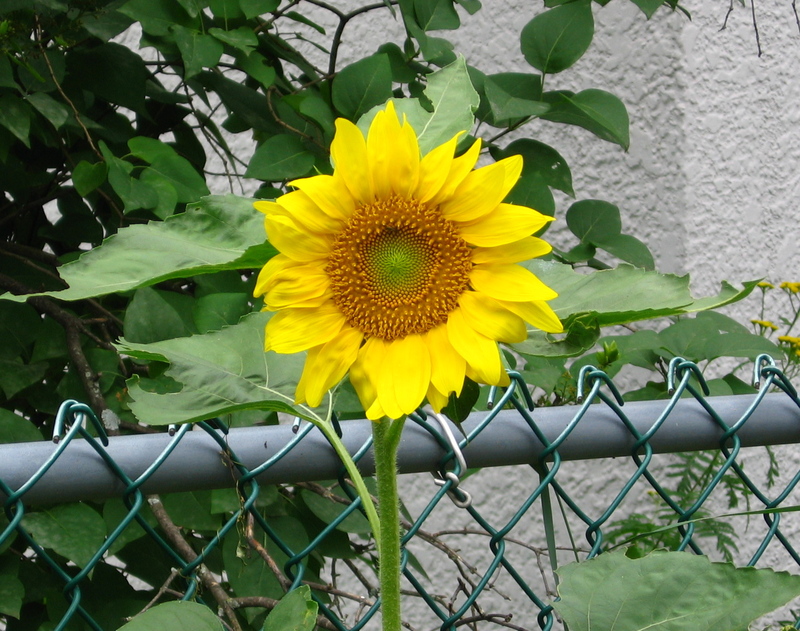 We were also delighted by a volunteer sunflower that has been growing in the compost pile. How the squirrels missed that one when they were running around the garden digging up all the ones we sprouted and planted on purpose I do not know. 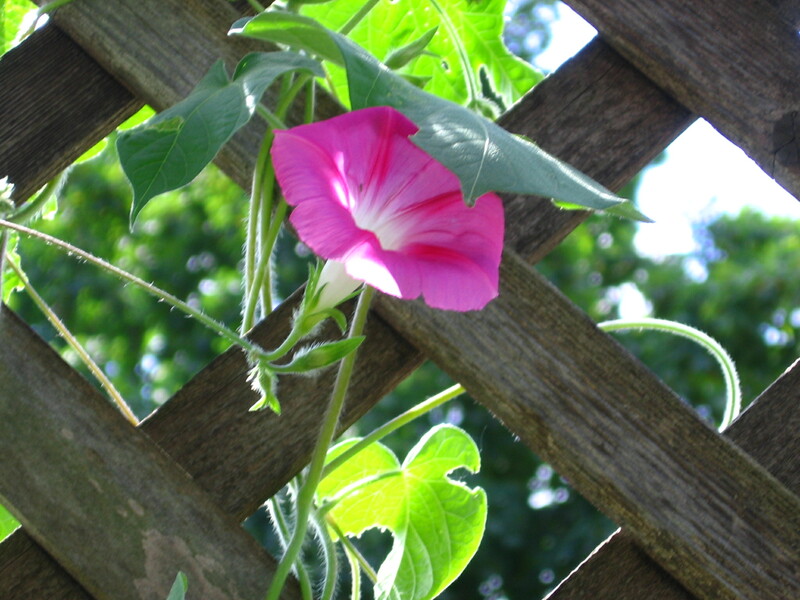 We also have morning glories blooming. These reseeded themselves from ones we had growing on the fence last year. Only last year they were blue and this year they are pink. used to be a huge bunch of the grass in the middle of the bed but it was so very happy there it was crowding everything else out. So we removed the bunch and now there are nice little patches mostly on the street-side edge of the bed that are pretty and interesting without being out of control. This bed will keep going for another couple of weeks before it begins to wind down. 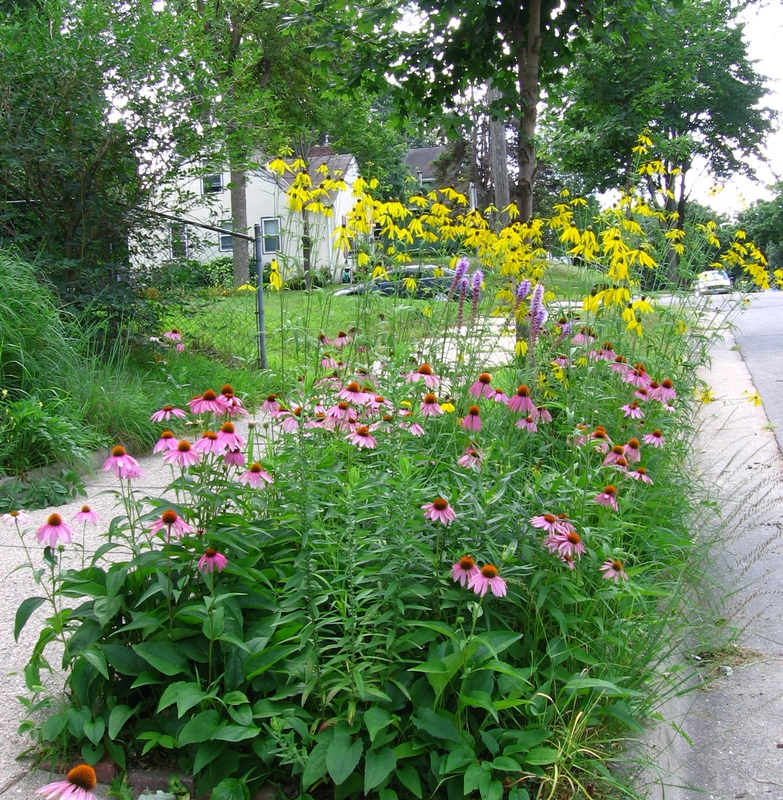 We leave the flowers up to die back through the fall because goldfinches like the coneflower seeds. And now I am going to stop rambling on and go spend some time in this garden of mine. I have more beans to pick, some weeds to pull, and a garden path to work on. I love hearing your garden update! All we have planted this year is tomatoes & basil. And of course Michael’s horseradish which is relly just like a weed!! Helen, I’m so glad! If we had only planted tomatoes and basil this year we’d be out of luck because they’ve not done well at all. I’ve heard horseradish is hardy. We ended up not getting any cuttings from Bookman’s coworker, but we’d still like to grow some eventually. Amazing zucchini. How many do you think you’ll harvest? I admire your garden, and thanks for the regular reports, letting us know what you’re growing and their progress. Arti, it’s hard to say. We’ve had about four so far, two of monster size, and there are five more small to tiny ones and counting. Glad you enjoy the garden reports! This garden-less city reader enjoys very much your “green posts”! 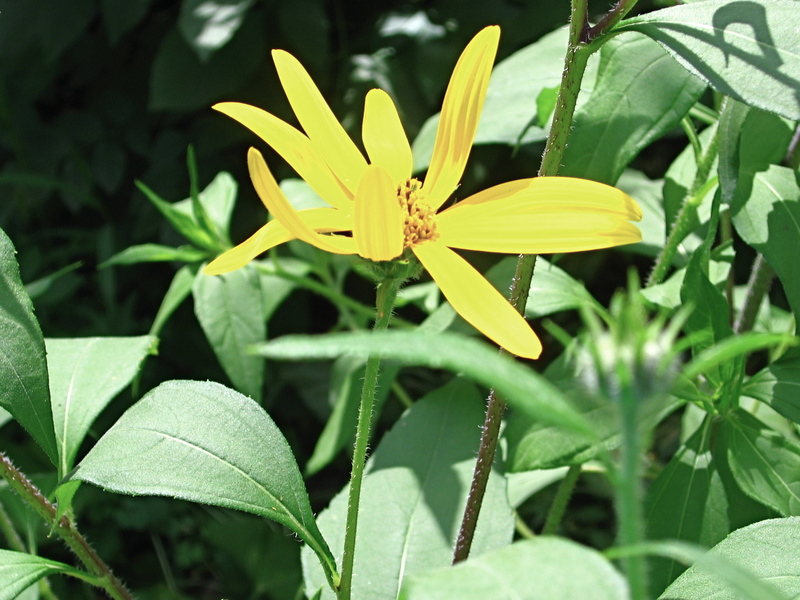 I never thought Jerusalem artichoke had nice flowers. Do you plan to eat them (the roots, of course)? smithereens, thanks! I am glad you enjoy them. I’ve never grown Jerusalem artichoke before so I didn’t know what to expect. The flowers are nice and cheerful. Yes, I do plan on eating the roots once the plant starts spreading out a bit and I can have some to eat and some to replant. I figure that will be next year or the year after. I am looking forward to trying them. This makes me long for my own garden.. And I never knew zucchini plants yielded so many zucchini’s! It is pouring here just now though it has not been a terribly wet summer so far in UK. Sorry for the recent hiatus and should be able to interact more with your excellent blog this week. Iris, gardens don’t have to be big or involved. Even herbs on a sunny windowsill count! Yup, zucchini plants yield a lot. I have never grown them before but I have heard enough stories that I knew only to plant two vines or risk having far too many. Come and live here, rain does not describe the deluge I was caught in this afternoon. I may never have to water the garden again! Alex, oh my sounds like you are probably handy at ark building 😉 We had so much rain in the spring and early summer and everyone was longing for a chance to dry out a bit and then we did and of course it has gone too far in the drying out direction. But we did get some rain and are supposed to get more tonight. Quite a relief. We hadn’t thought about that! The Bears are drafting an advert even as I write. Ark builders to the rich and famous! Bears must go free. I’ll swap you some of your beans for some of our rain! My beans are producing, but they’re not great this year. The courgettes, however, have gone crazy, and we’ve had about 15 so far. But I love them (and they are a great source of calcium) so that’s okay. Your garden sounds like it is doing wonderfully. Litlove, LOL, sounds like a good swap to me! Goodness, 15 courgettes so far? How many vines did you plant? And how can you not get tired of them? Do you have a favorite recipe for them? I had no idea they were high in calcium. Knew they were good for me but didn’t realize they were that good. 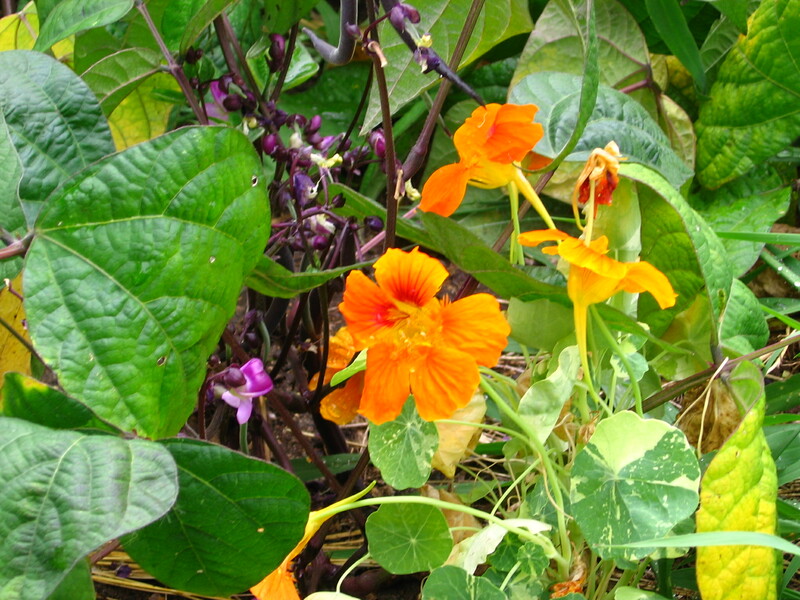 The parts of the garden that are doing well are doing very well. The parts that aren’t, well, they don’t really make it into the posts so much, but I think I will have to admit to some failures soon. I’ve been so busy this month I haven’t had time to catch up on blogs, but I love these garden posts so much. It’s been incredibly dry (as always) at my house but I’m having particular trouble keeping the butternut squash happy. I might put a little sprinkler on it tonight for awhile and deep-soak it. Poor thing. I didn’t plant any zucchini this year after experiencing the Zucchini Overload last year. Tomatoes are coming in and are so delicious! That’s one good thing about hot summers: yummy tomatoes! wherethereisjoy, so glad you like my garden posts. I have enjoyed writing them more than I ever thought I would. Summer has turned out to be overall so not hot that I still have only one tomato and it is not getting any bigger nor is it turning red. Mind, I like that it hasn’t been the usual hot and humid. I’d be very happy if summers were always like this! It’s just a shame that tomatoes need it hot.